Angola and French oil giant Total formally launched a major new offshore oil project Saturday to aid the country's economy that plunged into crisis following oil price dips in 2014. Project Kaombo, located in the Atlantic ocean 250 kilometers (155 miles) from the capital Luanda, is Angola's most significant offshore venture and cost $16 billion. Two boats, each more than 300 meters (985 feet) long, will pump crude from six subsea fields spread over an area of 800 square kilometers -- the same surface area as Paris. A record-breaking 300 kilometer-long network of pipes has been built 2,000 meters down to bring up the hydrocarbons. The first of the two new vessels, Kaombo Norte, produced oil for the first time in July and will be joined by its sister ship Kaombo Sul in mid-2019. The infrastructure will produce 230,000 barrels a day once fully operational, equivalent to 15 percent of the country's current production. 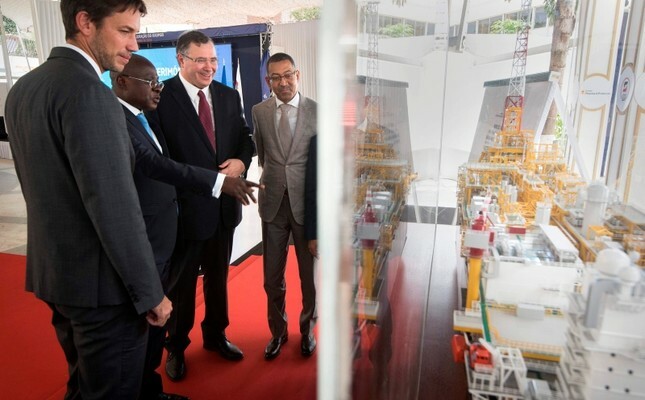 Total has led the project in partnership with Angolan state oil company Sonangol, SSI (a joint venture between Sonangol and China's Sinopec), U.S. oil major Esso and Portugal's Galp. Total produces 40 percent of crude pumped in Angola which is sub-saharan Africa's second largest producer behind Nigeria. "We will maintain our production levels in the coming years," Total chief executive Patrick Pouyanne told journalists. "There is a positive dynamic with the heightened petrol price and the desire of the Angolan government to back the industry which is welcome." But in 2014 a global slump in the price of black gold, which accounts for 90 percent of Angola's exports and 70 percent of government revenues, plunged the country into deep recession and weighed down the local currency. Last month oil prices reached their highest point for four years but have since softened. Angolan President Joao Lourenco, elected in 2017 after his predecessor Jose Eduardo dos Santos' 38-year rule, had promised an "economic miracle" that would end the country's dependence on oil. In recent years the southern African nation's output has dipped to 1.5 million barrels per day on average. "It is our goal to maintain production, the government is committed to the level not dipping during its term in office," said oil minister Diamantino Azevedo. Nearly half of the Angolan population lives below the poverty line.